About 69 per cent have died from gunshots, 9 per cent burnt to death, 5 per cent beaten to death, including 730 children under the age of five. According to the Red Cross, some 300,000 Rohingya are left in Myanmar. For a young Buddhist native of Rakhine, the international media coverage is one-sided. Naypyitaw (AsiaNews) – At least 6,700 Rohingya were killed in the month after violence broke out in Rakhine State, western Myanmar, in August, this according to Médecins Sans Frontieres (MSF) based on surveys of refugees in Bangladesh. According to the NGO, the number of victims is much higher than the official Myanmar government figure of 400, most of whom were deemed "Bengali terrorists" with the Arakan Rohingya Salvation Army (ARSA). MSF said the figure was "the clearest indication yet of the widespread violence" by Myanmar authorities, which forced more than 647,000 Rohingya to flee the state. The aid group's survey found that at least 9,000 Rohingya died in Myanmar between 25 August and 24 September. "In the most conservative estimations" at least 6,700 of those deaths have been caused by violence. In all, 69 per cent of the violence-related deaths were caused by gunshots, 9 per cent were due to being burnt to death in their houses, and 5 per cent were beaten to death. Among the 730 children below the age of five who died, MSF says more than 59 per cent were reportedly shot, 15 per cent burnt to death, 7 per cent beaten to death and 2 per cent killed by landmine blasts. Dominik Stillhart, director of operations at the International Committee of the Red Cross, the only international organisation with broad access on the ground in Rakhine, said yesterday that basically no Muslims have returned home. The Red Cross estimates that only about 300,000 Rohingya remain in the entire state. Yet people are continuing to flee, with around 300 still crossing the border each day, mainly because of fear and anxiety for the future. Stillhart noted that the area did not seem heavily militarised at the moment, and there was no indication troops or police were restricting people's movement. "The government has already started reconstruction in the villages destroyed by the violence,” said Hla Khine, a young Buddhist native of Rakhine, speaking to AsiaNews. “However, we from local ethnic groups do not want to live with the Muslims anymore. For years we have suffered their provocations and violence, but nobody talks about this." The young man criticised international media for the way it covered the humanitarian crisis. "They only listen to the stories of Muslims,” he said. “The problem is that Myanmar is weak and cannot counter the power of big media financed by Arab money, which are obviously biased." “On the border with Thailand, there are nine refugee camps for people displaced by fighting between ethnic militia and the Myanmar army. There are thousands of Shan, Mon, Chin, and Kachin refugees, all ethnic groups that are native of Myanmar. They too are denied an identity papers, but for them the world is not outraged . . ."
“The centre of the violence (the villages of Maungdaw, Buthidaung and Rathedaung) are a Muslim stronghold in Rakhine. Locals are only 2-3 per cent of the population. For years, terrorists have been seeking recruits among young people in the area. Four Muslim village leaders were killed for reporting the incident to the authorities. “Some organisations support them, finance their entry into the country and travel to large cities. For example, I was told that they are willing to pay 1 million kyat (about US$ 735) per person to be taken to Yangon." For their part, Myanmar authorities are planning to implement the report of the Advisory Commission on Rakhine chaired by Kofi Annan, as well as economic development programmes. 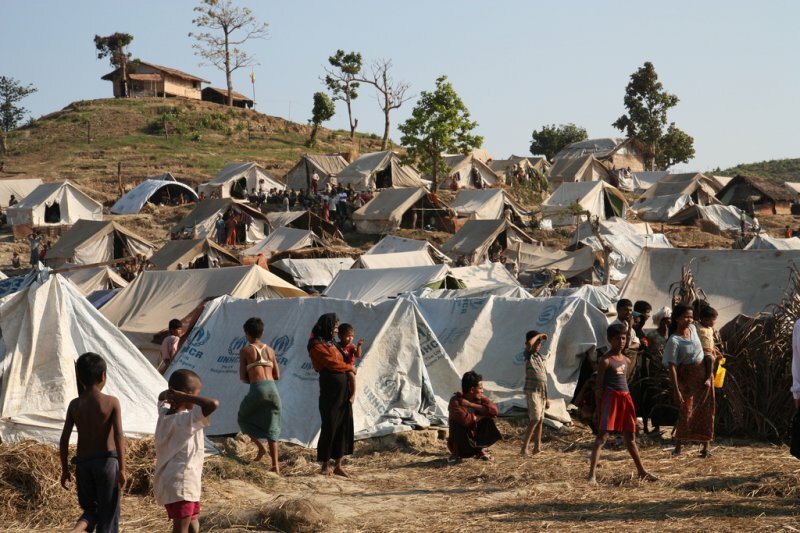 Myanmar has also signed agreements with Bangladesh for the gradual repatriation of refugees.